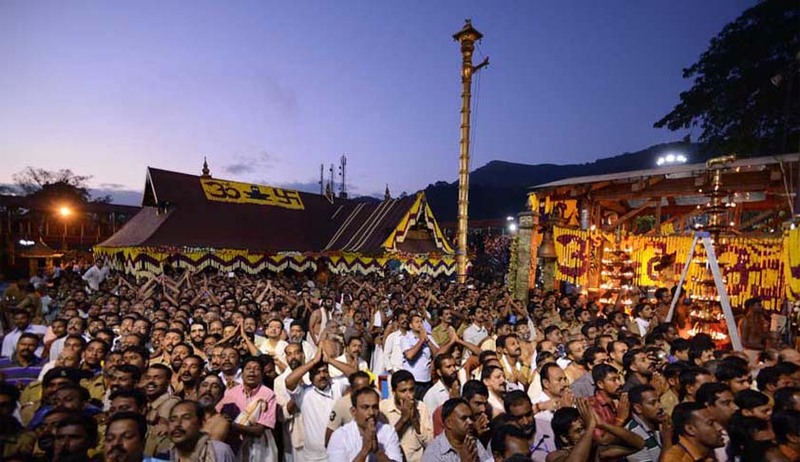 In an additional affidavit filed before the Apex Court, the Kerala Government has taken the stand that entry of women between the age of 10 and 50 in the Sabarimala Ayyappan temple is a matter of religion and that the decision of the priests is final in such matter. It further submitted that the restriction is in line with the unique “pratishta sangalp” or idol concept of the temple, and the same is an integral part of the right of practice of religion of a devotee. Contending that it is duty bound to “protect the right to practice the religion of these devotees”, the State withdrew an earlier affidavit filed by the LDF government in November 2007, which had supported entry of women into the temple. The LDF government had favored appointment of a commission of scholars to facilitate the change, stating that “it is not fair to deny a section of women from entering Sabarimala Temple and make worship”. A Bench of Justice Dipak Misra and Justice N.V. Ramana would take up the matter on February 8. The recent affidavit relies on the decision rendered by the Kerala High court in the case of S. Mahendran v. The Secretary, Travancore, AIR 1993 Ker 42, wherein the Court had held that the restriction imposed on women aged above 10 and below 50 from trekking the hills of Sabarimala and offering worship is in accordance with the usage prevalent from time immemorial. The High Court in that case had noted that the deity at Sabarimala is in the form of a Naisthik Brahmachari. “Since the deity is in the form of a Naisthik Brahmachari, it is therefore believed that young women should not offer worship in the temple so that even the slightest deviation from celibacy and austerity observed by the deity is not caused by the presence of such women,” it had observed. It further pointed out that the State had “erroneously” sought to support the present Writ Petition questioning the legality Rule 3(b) of the Kerala Hindu Places of Worship (Authorization of Entry) Rules, 1965. The earlier Affidavit was sought to be withdraw in view of these ‘mistakes’. “In the context of the Sabarimala Temple, the administration of the temple vests with the Travancore Devaswom Board under the provisions of the Travancore-Cochin Hindu Religious Institutions Act, 1950. Under S. 31 of the said Act, there is a statutory duty cast on the Devasom Board to arrange worship in temples in accordance with the usage. Therefore, in matters of religion, it is the opinion of the priests that is final,” the affidavit further stated. The Court is hearing a PIL filed by the members of the Indian Young Lawyers Association, which was referred to the three-Judge bench by a two-Judge bench comprising Justice S.B. Sinha and Justice V.S. Sirpurkar on 8 March 2008, in view of the serious Constitutional questions involved. Soon after, Naushad Ahmed Khan, President of the Indian Young Lawyers Association, had approached the Apex Court, seeking to withdraw the petition citing threats to him. But a bench headed by Justice Dipak Misra refused to allow him to withdraw. The Court had then asked the Delhi Police Commissioner to file a report on the steps taken on the complaint of death threats filed by Mr. Khan. You may read the LiveLaw article here.